With the years of experience and vast knowledge, we are engaged in offering a wide range of Self Lock Bag to meet the demands of our customers. 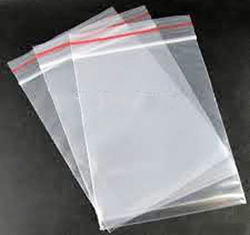 These bags are widely used for packing eatables for taking it out door for lunch or for picnics. Available at market leading prices, we also offer customization services at competitive prices. Max Packaging got established in 2015 as a Sole Proprietorship firm in the industry. Since establishment, the company has directed its all efforts towards offering a broad spectrum of packaging products. From our operational headquarters located at Chennai, Tamil Nadu (India), we are managing our business activities very successfully. We are specialized in corrugated boxes, EPE Foam, PU Foam and manual grade stretch film. Max Packaging offers the products in all shapes and sizes. Our manufacturing range includes corrugated divider, corrugated printed box, corrugated pad and corrugated carton box. We also deal with Air Bubble Bags Plain/Antistatic, Zip Lock Bags, PVC Stretch Film manual grade, PP Bags, specialized packing cover (Antistatic Bags, VCI Anti corrosive Bags) and other different types of packing cover plain/printed. We believe success of the company lies in the hard work and dedication of the entire team of skilled professionals and the support of customers. Our products are developed incorporating material, which is reliable and high in terms of excellence. We have well experienced teams for different department and units with all the necessary tools to give satisfied product range to our customers and also day to day improving our team to get the better opportunities from our existing customers. Our products are highly celebrated among our customers for their flawlessness, cutting-edge technology, enormous durability, outstanding performance and many unlimited features. All the products that are produced at our processing unit are checked on a number of quality check points and only the ones that quality, are made to reach the customers.